At Lang Carpet we offer the widest selection of quality carpeting and rug options for your home. Whether you are looking for the perfect rug to add interest to your space, or need full custom design and fabrication, we are here to guide you through the process. For inquiries, call or visit our showroom. This is a custom designer wool staircase that was custom installed in a beautiful home. 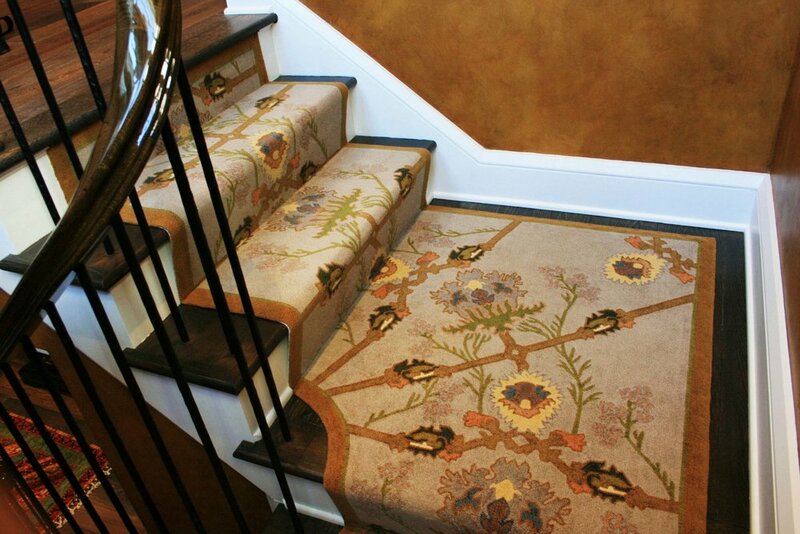 This custom designer wool carpeting was installed to match the custom staircase. 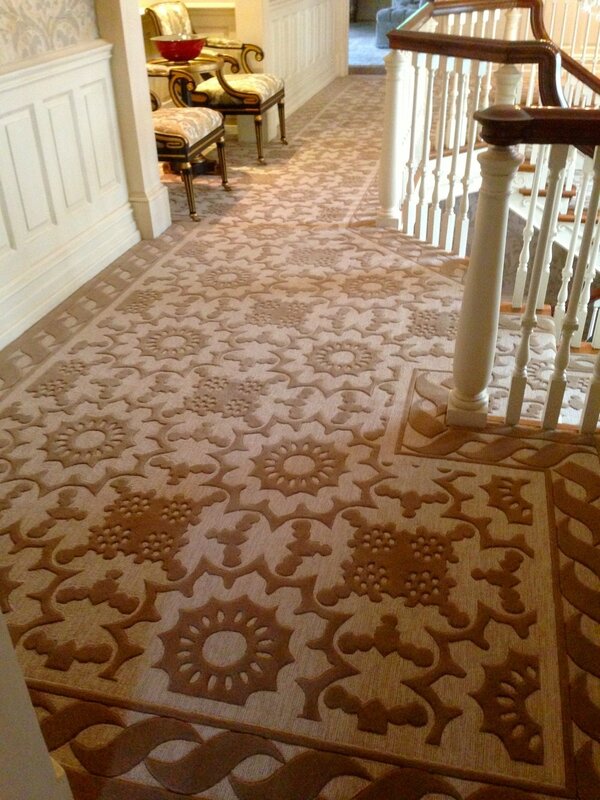 This designer wool carpeting is an example of our custom work, which can be made for any space. This is a beautiful designer wool staircase. TheseWonderful accent chairs coordinate beautifully with this custom designer wool carpeting. 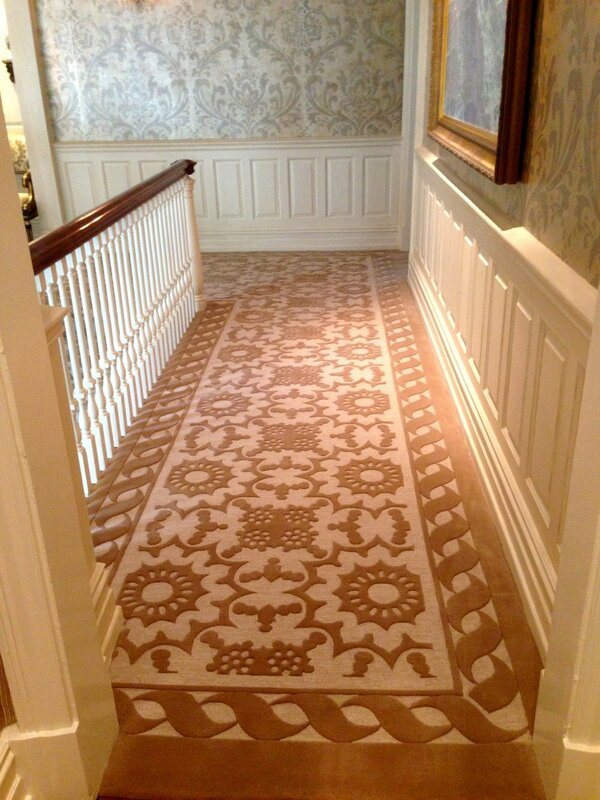 The intricate pattern of this designer wool carpeting is lovely statement in this space. 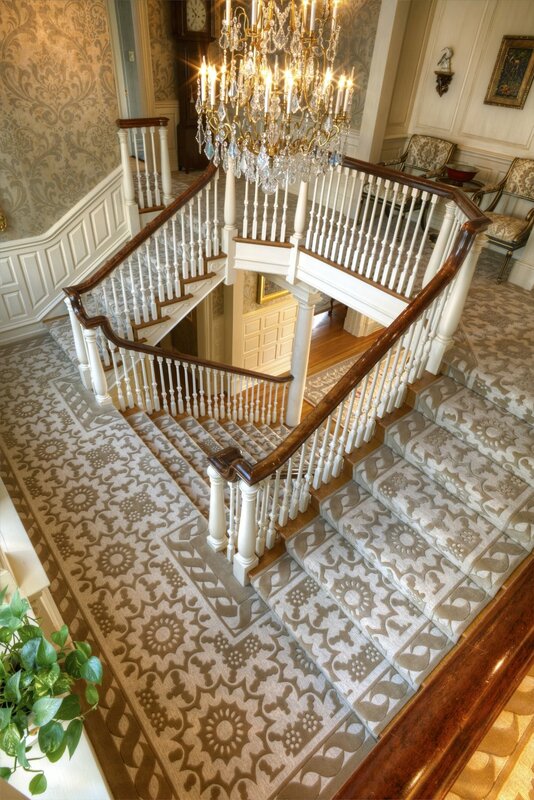 A close-up of this custom designer wool carpeting shows the intricate details. This custom designer staircase is a perfect accent for the marvelous architecture in this home. 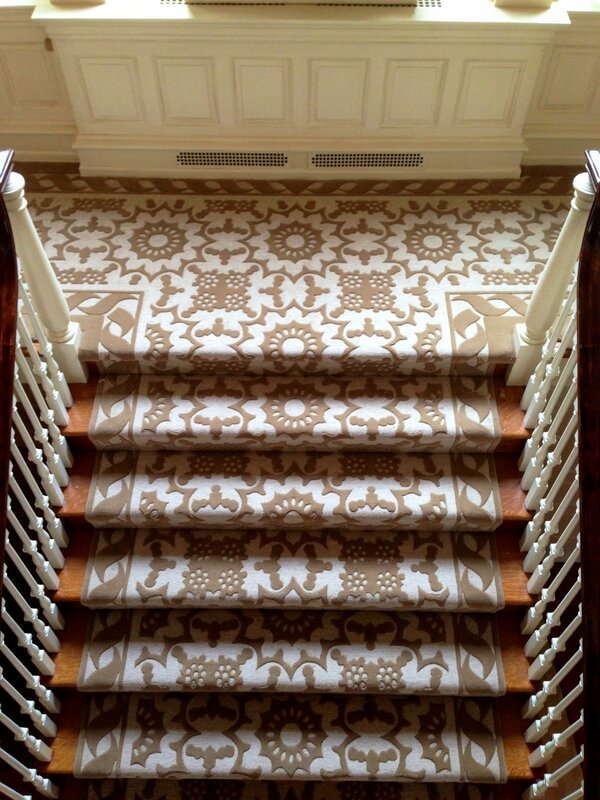 This gallery features pictures of a geometric-patterned, flat-woven stair runner that was custom installed for Dilwyn Designs. This beautiful flat weave carpet looks great as a stair runner and can also be made into custom rugs. This geometric pattern stair runner is a great feature in this transitional style space. Beautiful hand-knotted rug in an organic pattern is the perfect accent to this beach house bedroom in Avalon. 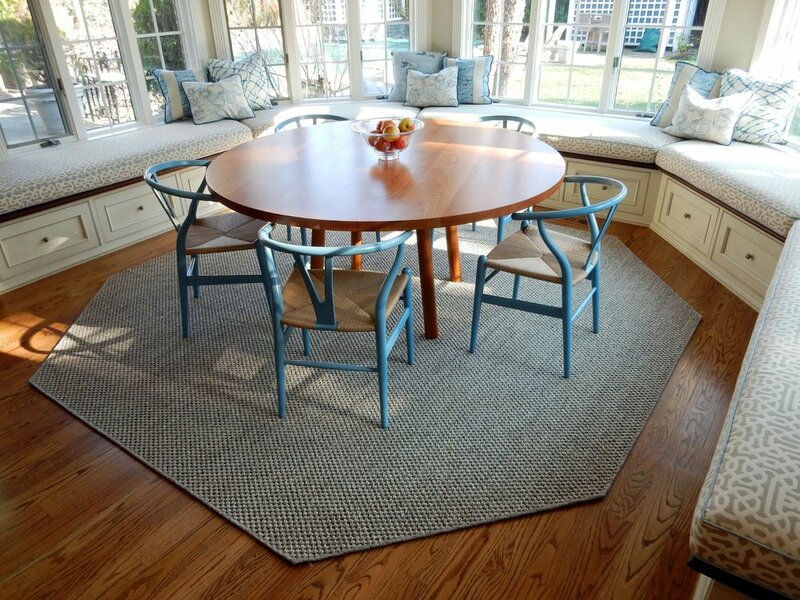 Custom border rugs coordinating in living room and dining room. Lovely custom made border rugs with clipped corners, are an elegant addition to this space. This custom border rug beautifully frames this elegant dining table. These custom border rugs are hand carved to add detail and definition to the pattern. These accent chairs look wonderful with the wool herringbone carpet. The adorable dog is a great touch too! In addition to our extensive residential carpeting and rug options, we also offer commercial carpeting sales and installation. This commercial office entryway features both carpeting and luxury vinyl tile flooring.